It was certainly an exciting day at preschool! With Valentine’s Day parties, torrential rain, and a Love-Run-Turned-Dance-A-Thon, we will be napping very well today, indeed! The morning began with Valentine’s Parties in each classroom. The children enjoyed crafts, activities, special treats, and of course, exchanging Valentine’s cards! We want to send out a HUGE thank you to all the parents who volunteered to host and support these parties! To culminate the morning, our plan was to participate in the Love Run Fundraiser. 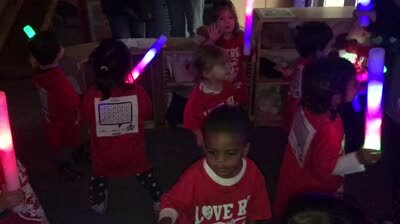 While many of us were looking very forward to experiencing the PCS “Love Run,” due to the torrential downpour of rain, the administration had to make a very quick and difficult decision to stay at the preschool and have a “Dance-a-Thon” as an alternate version of the Love Run. While older kids can dart across the campus to avoid the rain, it really does take our “Littles” about 10 minutes to get to the auditorium on our “train ropes” as a class, which would have made for a very soggy set of children! As you know, for many preschoolers, there is a very fine line between just the “right amount of fun” and “too much fun” (or too much stimulation), which can lead to undue stress and emotional meltdowns. With these factors in mind, we opted to ‘dance it out’ in our very own “Glow-Themed-Dance-A-Thon!” The teachers went above and beyond to make this quick switch, and each classroom got to use glow sticks to dance for 20 minutes (the duration they would have been running). Check out the videos to see our students in action! The children had a great time!